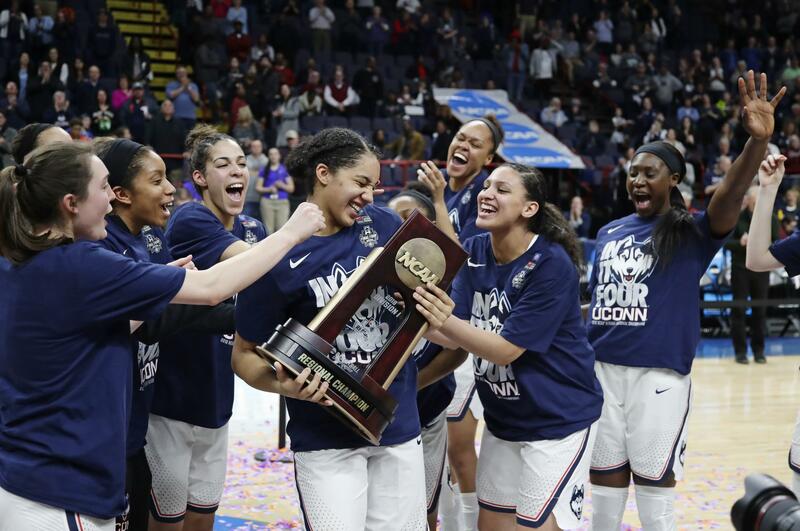 Mon., March 26, 2018, 7:30 p.m.
ALBANY, N.Y. – UConn coach Geno Auriemma and the Huskies are headed back to a familiar spot – the Final Four. UConn will play the winner of the Spokane Regional on Friday night in Columbus, Ohio. “Tonight, my teammates did a great job of finding me when I was open and I was able to knock those shots in early,” Dangerfield said. UConn went right at South Carolina in the first half, connecting on 9 of 10 3-pointers – including a perfect 5 for 5 by Dangerfield. Her last 3 of the second quarter made it 52-31 and delighted a crowd that included former UConn greats Tina Charles and Breanna Stewart, who helped the Huskies to four consecutive national championships. Stewart grew up 2 hours west of Albany. Katie Lou Samuelson scored 17 points and Napheesa Collier had 16 as UConn shot 59 percent (37 for 63) from the field. Williams was named most outstanding player of the region. Wilson had 27 points for South Carolina (29-7), but it wasn’t nearly enough. Coach Dawn Staley took her star out with just over 3 minutes left in the game and her team down 31 points. Published: March 26, 2018, 7:30 p.m.